Level Up! 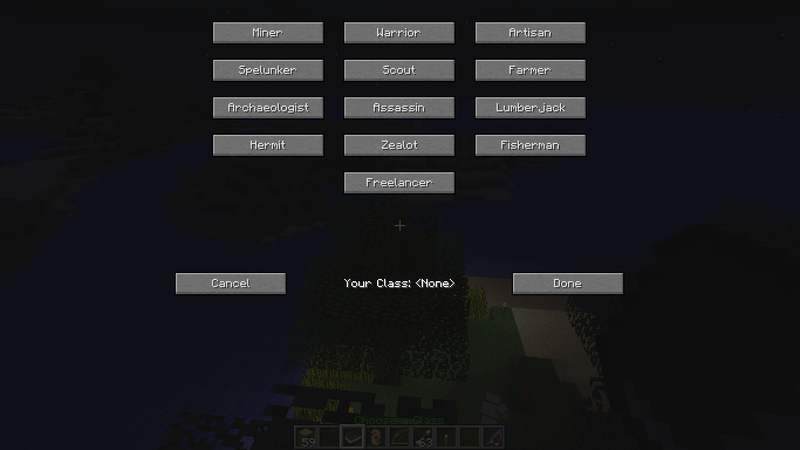 is a class and skills system for Minecraft. Created by Remalis for Beta 1.8.1, it was left unupdated after release 1.0 until release 1.6.4, where it was picked up and updated by GotoLink until release 1.8. As of release 1.10.2, I've decided to pick up the torch and attempt to provide continuing support. The mod comes in two versions: The original, left mostly intact with a few tweaks, and the rewritten version, which was rebuilt into a mod that provides a skill tree and a level spending system. This is the page for the rewritten version. The original legacy version can be found here. Alongside these classes are 12 skills. Currently, the rewritten version allows you to choose one of three specializations, which determines what gives you bonus XP, mining, crafting, and combat. After you choose your specialization, you can open up the skill menu to see the three different skill trees. This is different from the original in that you spend your levels to skill up, rather than be allocated skill points. This is meant to provide incentive to stockpile levels, but not to the point where you would neglect other mechanics that rely on them, such as enchanting tables or the Ender IO Soul Binder. 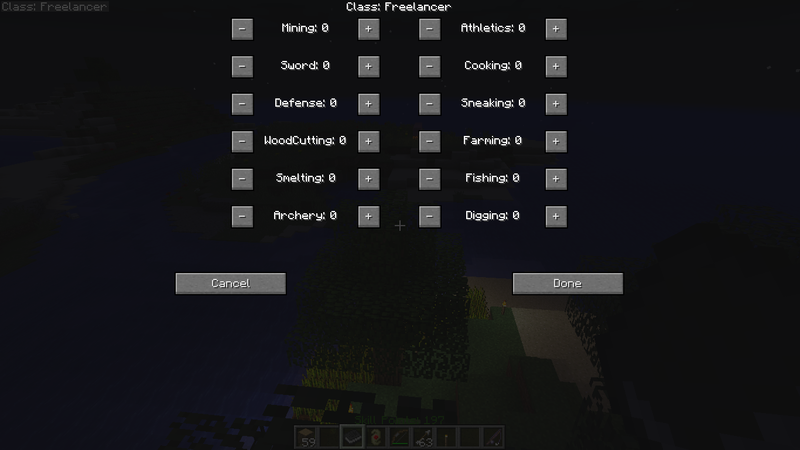 Choose your play style and allocate points to enhance your Minecraft experience! I want to support server multidimensionality because servers often need to create new worlds, such as dimensions 2, 3, and 4. Currently, only one overworld is supported, and if you create a new dimension, it will conflict and you won't be able to re-adjust your skill points. 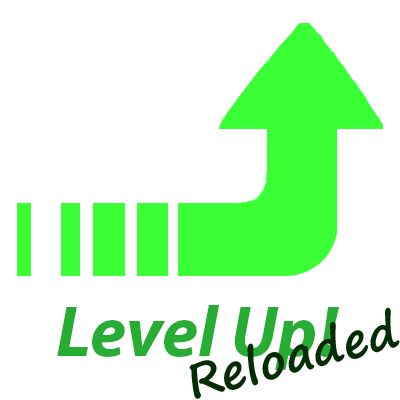 Does level up reloaded contain mob buffs like the original? or no? Mod page is unclear about what stays from original and what goes. I accidentally clicked mining when I wanted crafting how can I fix this? Would removing the mod and adding it again fix this issue? There's a book that allows you to change your specialization, but it has a price by default. How do you make the book? Maybe it's not what you're going for, but I think a good feature would be an option to keep your skills after you've died. I honestly just find it annoying that I lose that progress, because it's not like the upgrades come cheap. I for one (obviously) would love to see that as a future feature. Look in the config file, you can disable the skill reset. Hi there! I have a random suggestion/question. The addon Mystical Agriculture introduces an Inferium Furnace, which is a normal furnace that works a bit faster. Is there any way I can configure the mod to allow me to bind it to my player? If not, is it something you can build in? Thanks! It's something I've thought about, and it's really not something that can be done easily on the user end. The way everything works, the capability that causes the speed boosts needs to be uniquely tailored to most tile entities to eliminate any quirks that would arise. This is especially true with Mystical Agriculture's furnaces. Is there a way to make the player start out with a certain skill? Let's say I wanted to make the player spawn with maxed out stealth. Is this possible? While you can edit most things related to skills, there isn't anything in the main mod that allows you to assign a skill by default. Alright, thanks for the reply! Do you think it's something you might add in the future? It might be, if I go back to active development on this mod. I'm currently trying to get another project off the ground at the moment, so any other mod I'm working on solo will only get maintenance updates if needed. Is there a way to lock mods behind the different skills ie. mining level 5 would unlock tinkers construct? Not in the base mod, no. Though, it is open enough that someone might be able to accomplish that with an addon.